"It is not a coincidence that the murder and the Balakliya fire took place on the same day." President Petro Poroshenko does not believe that the murder of former Russian State Duma MP Denis Voronenkov and the fire at the arms depot in Balakliya, Kharkiv Region occurred on the same day by mere coincidence. "The insidious murder of Denis Voronenkov in central Kyiv is an act of state-sponsored terrorism on the part of Russia, which Voronenkov was forced to leave for political reasons. There's a clear modus operandi of the Russian secret services, which was repeatedly demonstrated in various European capitals. 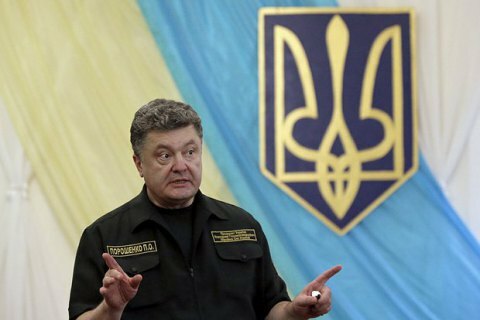 He was one of the key witnesses of Russian aggression against Ukraine, in particular of the role which Yanukovych played in the incursion of Russian troops into Ukraine," Petro Poroshenko said at a meeting with law enforcers on Thursday, 23 March. "I reckon it was no coincidence that the murder occurred on the same day as the sabotage in Balakliya, Kharkiv Region," the president concluded. In the small hours of 23 March in the city of Balakliya, Kharkiv Region, a fire broke out in the territory of Ukraine's largest military depot. The fire caused the detonation of 125-mm tank shells and 152-mm artillery shells. According to the military prosecutor's office, it was an act of sabotage, in the course of which incendiary devices were dropped from an enemy drone. The depo accommodated 125,000 tonnes of ammunition in numerous warehouses on the territory of 368 ha. Firefighting effort is constrained by ongoing ammo explosions. Former State Duma MP Denis Voronenkov was shot dead outside the five-star Premier Palace hotel in central Kyiv on the afternoon of 23 March. In the end of 2016, Voronenkov moved to Ukraine and was granted Ukrainian citizenship. He was one of the witnesses in the case of high treason by ex-President Viktor Yanukovych.